We leave for Jamaica next Saturday! As in, 8 days from now. It's going to be hot, sunny, pina colada-drinking goodness for an entire week of vacation. And the one thing you need for a vacation like this, other than the all-inclusive wristband that lets you eat and drink like there's no tomorrow, is a swimsuit - multiple swimsuits actually, for obvious reasons. So this weekend I need to go swimsuit shopping because I obviously have nothing to wear. 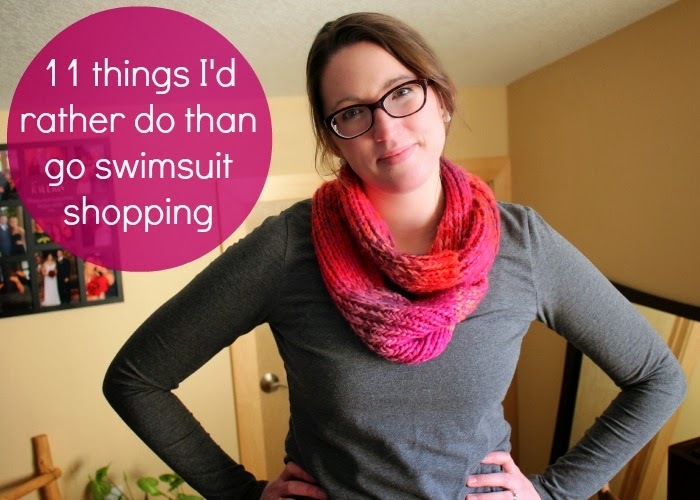 Is there anyone out there who actually likes swimsuit shopping? It's the beginning of March in ND which means my skin is totally white and I haven't exactly been hitting the gym super hard lately. What sounds fun about keeping on my own undergarments while I try on public swimsuits in a dressing room with fluorescent lighting and a mirror 6 inches from my body? Not fun. Not fun at all people. 1. Get my eyebrows waxed. 2. Get probably any other body part waxed, too. I don't have a lot of experience with this but it can't be as bad as the white skin and fluorescent light combo mentioned above. 3. Walk along a hot gravel road barefoot. 4. Listen to Taylor Swift on repeat. 5. Sit next to someone on the airplane who won't stop talking incessantly about their friend's adventures, medical appointments, or extraordinary IQ. 6. Take a shower in the women's locker room at the gym without separate stalls. 7. Agree to never shop at Target ever again. 8. Go in for my annual lady's doctor appointment. 9. Spend my weekend at a youth hockey tournament in which I have no children particpating. Oh wait, I've totally done that already. 10. Do a cleanse. I realize lots of people do these by choice, but I just can't imagine going a long period of time living off certain liquids and not chewing any solid food. 11. Give up wine forever. Ok I maybe got a little dramatic there because I don't think I'd actually give up wine forever, but you get my point. I guess the reward of sitting in my swimsuit in sunny, 80-degree weather at 10:00 am while drinking a daiquiri will probably make the entire experience worth it. But still. Heading to the mall tomorrow is not high on my list of reasons I'm looking forward to the weekend. Have a happy weekend. I hope yours is less awkward and unappealing than mine is looking to be. And linking up with Whitney with a song that seems completely appropriate for this post!